Promotion Pros is the best place online to buy custom fitness products to not only advertise your business, but to promote a healthy lifestyle. We are stocked with the ever-popular activity tracker bracelet, jump ropes and exercise bands, so no matter what you're searching for, you'll find something that fits the bill. Our customized fitness items are great for companies to pass out to employees to keep them focused on health and to let them know you care. Showcase your company name and logo at health related trade shows and use functional items to do it! 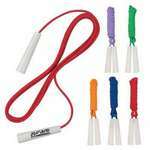 The Budget Jump Rope is a simple way to promote your brand to a wide audience. It consists of 4" plastic handles, and an 8 foot rope. 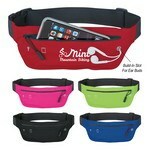 The custom Cadence LED Arm Band features red LED's to give you constant lighting or flashing LED lights. The Cadence LED Shoe Clip Safety Light features one steady bright red light and one flashing red light. The Yoga Stretch Band features stretchable latex material and allows inserting custom details to make impressive Business Giveaways. Inspire and encourage your employees' well-being with a trendy branded Double Pouch Reflective Waist Belt to keep them moving. 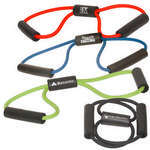 Keep fit at all times even while traveling with the Exercise Band. The band is made from latex and features EVA foam handles. 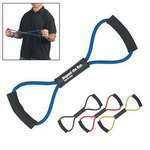 Hand Grip Exerciser is a resistive metal exerciser with soft EVA grips. 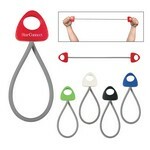 The exerciser helps strengthen hand muscles. The Jump Rope is a simple and effective way to promote exercise, while watching your brand awareness move forward and backwards in leaps. 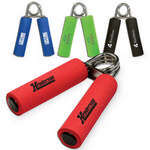 The blue jump rope is made from woven nylon and has 6 1⁄8" wood handles for a comfortable grip. Our Large Workout Band offers 11 pounds of resistance along with long-term brand recognition. Gain exposure for your band every time the Exercise Band is used. Imprint your logo on it, using standard pad print colors and convey a sporty image of your brand. Our Lycra Running Belt Fanny Pack features an interior key pocket with a large zippered front pocket to store necessities. It has a built-in slot for ear buds with an adjustable elastic waist strap. It also comes in several gorgeous colors. The Medium Workout Band is portable and allows you to fit any exercise into your daily routine.